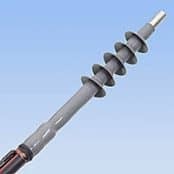 Thorne & Derrick distribute Nexans Cable Terminations for medium and high voltage electrical cable systems, 11kV/33kV – we provide competitive prices for both heat shrink and cold shrink applied cable terminations from extensive stocks to UK and international destinations. 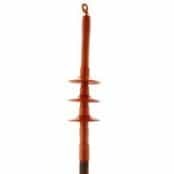 Nexans terminations suit single and 3 core polymeric insulated (XLPE and EPR) and paper insulated (PILC and PICAS) cables with copper tape or copper wire screens. 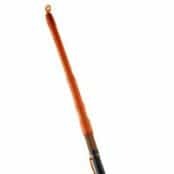 Nexans heat shrink cable terminations include anti-track and stress control tubings with water sealing mastics and cable breakouts (3 core cables) to effectively terminate and connect MV-HV cables in both indoor or outdoor applications (including rain shed kits). 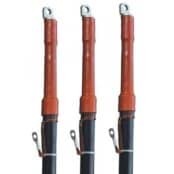 Nexans cable terminations are used for connecting 11kV/33kV power cables into MV-HV electrical equipment including switchgear, transformers and substations – heat shrink terminations are available for both single and 3 core polymeric (XLPE EPR) cables. 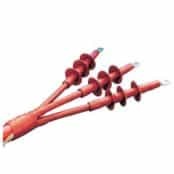 Nexans cable terminations are suitable to terminate 33kV/36kV medium voltage cables with optical cable tubes – this includes Nexans TSLF single and 3 core cables: XLPE insulated, metal screened cables with laminated aluminium and outer semi-conducting layer. Thorne & Derrick also distribute Nexans Euromold Connectors for MV-HV cable termination of 11kV, 33kV and 66kV polymeric insulated cables (XLPE EPR) into gas insulated switchgear – we provide competitive prices for Nexans Euromold connectors from extensive stocks to UK and international destinations. ➡ Should you require customer service or technical support please contact us – view the full range of Nexans Cable Terminations below.